willwroe replied to willwroe's question in SOS! Help!! Hi I'm not sure if anyone will be able to help but I'm just looking for a few things for my 1.6 deck. I'm looking for: -Standard exhaust centre section -heater resistor -passenger side wing mirror (electrical) -centre console clock (or just the bulb if it can be changed). Any suggestions on where I can find this stuff would be great! Yeah I think I'm going to strip it down soon and see exactly what's happening inside. I was thinking the temperature control could be faulty so it's not moving off cold setting but I'll hopefully see what's up straight away. Cheers for the help everyone! Could the resistor contribute to the fact there's no warm air being blown? Is the heater resistor hard to get to? Yeah I'm fairly confident it's the same on all settings. But I guess I can try take the heater out and see if there's anything obvious that's wrong. I'm not sure if it might be linked but the first three settings on the fan power don't work. So only the last two on the dial blow air. willwroe posted a question in SOS! Help!! Currently my heaters refuse to blow hot air. No matter how long I'm driving for they just blow cold air. I've made sure to bleed the cooling system so there's no trapped air but it's made no difference. Anyone have any ideas to what it could possibly be? 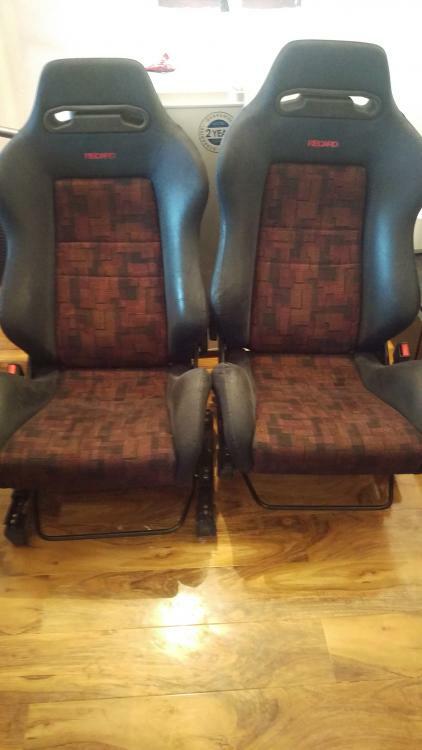 I've just purchased a set of atr recaros and was wondering if anyone has possibly ran these seats before and know the best way of making them fit. I've got a few ideas but I just want to make sure I'm not overlooking an easier method first! Never mind then mate, cheers anyway! Is the steering wheel and boss available mate? How much will you be wanting for them mate?